TAO GROUP BLOG TAO NIGHTCLUB LAVO NIGHTCLUB TAO BEACH LAS VEGAS: BEST NIGHT EVER! After a fun day in the not so much sun we all parted ways to get some rest before the long night ahead. I headed back down to The Palazzo to LAVO where I met up with Perez and his fam and friends for dinner. We had a specially prepared tasting menu brought out which was out of this world! Perez LOVED it, he had just come from CHER so he was on a roll. After dinner, we hopped in a car and went to see KATY PERRY perform. Super fun! She is great live. We had a great seat for the show and Katy came out and sat with us afterwards. Perez grabbed Katy and her peeps after and we hopped in a car together and headed back to LAVO singing Disney showtunes along the way. LAVO was SO much fun, we got a nice table on the dancefloor and DJ REACH played a special set just for Perez and Katy, Madonna Megamix!!!! Perez, Katy, and like 8 of us stayed late dancing up a storm. Over at TAO things heated up late night when Paris and Nicky Hilton arrived with Jeff Beacher and co. The group sat at the owners table and enjoyed the sounds od DJ VICE who made his return to TAO last night. WE certainly missed him and we are glad he is back! TAO Friend Wilmer Valderamma was in as well with his friends to support VICE. 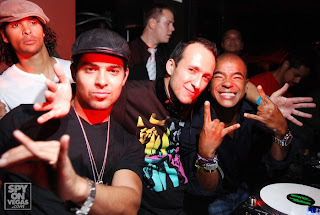 Superstar DJ ERICK MORILLO popped up late night as well! Everyones groups seemed to meld into one and the night was amazing! Afterwards, I made a quick pit stop to see Kourtney and Khloe Kardashian who were in town for the night. Heading to TAO BEACH - see you tonight for MORILLO AT TAO and VICE at LAVO!